I was visiting Exeter recently and took the opportunity to look around the Cathedral. Plenty caught my eye amongst the ancient splendour. 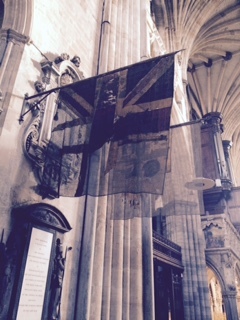 Beautiful flags which were so old they were literally see-through. 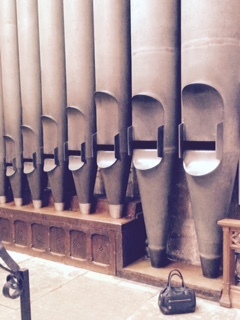 Huge organ pipes (my small handbag is placed so you get the scale). 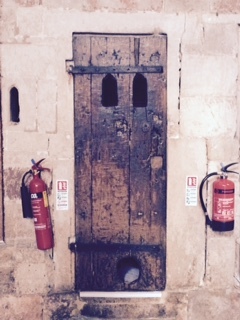 A medieval Hobbit-like door with some 21st Century Health and Safety equipment on hand. 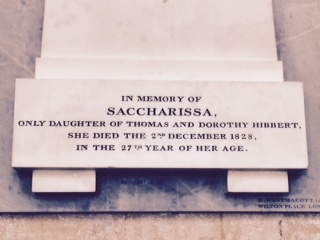 Another thing I noticed was a memorial stone for the daughter of Mr and Mrs Hibbert, whom they called “Saccharissa” and who died in 1828. Now there’s a name which should be brought back pronto. It makes me think of sugar. Italian sugar. I bet she was kind and pretty. In the 19th century, the most popular given names were Mary and either John or William for girls and boys, respectively. We may think that the more crazy end of the Christian name market comes from the 20th and 21st centuries. Not a bit of it. The ‘heir hunter’ genealogy firm in London, Fraser and Fraser, recently came up with a list of bizarre names from 19th Century birth, death and marriage documents. My favourites are Zebra Lynes – a girl born to James and Mary Lynes in Southampton in 1875; Mineral Waters, born in 1892 to Henry and Emma and (definitely the best) One Too Many Gouldstone, born in 1870 to Robert and Martha of Walthamstow, London, who were clearly wishing for a bit of a rest. So, eat your heart out Apple and North West, Bluebell Madonna, Bronx Mowgli and Moon Unit. This has been going on for years – there is nothing new under the sun.